This was my first and the last cold Korean soy bean noodle. Why did I try to even have a sip? Actually, the night before savouring this I just randomly chose the only 5 available channels on my Korean television and one of it showed the process on how to make cold Korean soy bean noodle. If I'm not mistaken the documentary is from MBC - sisigakgak 시시각각. It's right after MBC 9pm news. The reporter went to 3 shops and tried to differentiate the taste as so many shops selling this cold Korean soy bean noodle but which one offers the best and the most authentic taste? But for me, I really have no clue but I guess mine was number 2 cause I could sense the peanut aftertaste on my tongue. Anyhow, the taste is indescribable. 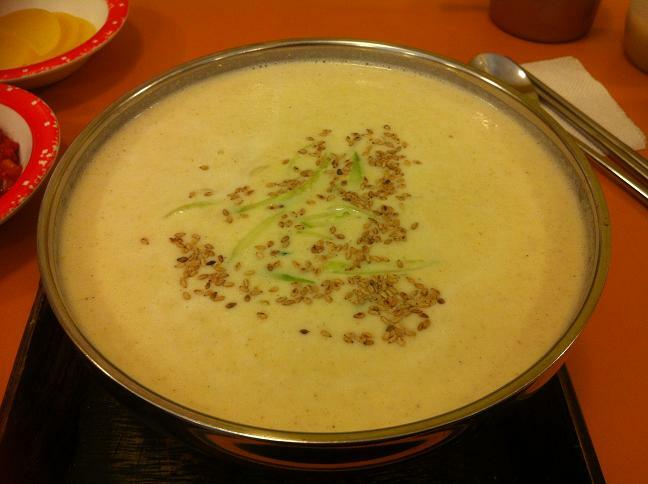 The soybean broth basically..hmm..taste like soybean. ^^ The noodle is lightly salted I guess. When I told the employee that I couldn't taste anything out of it, she told me whether I would like some sugar to go with it. Whattttttttttt??! !...No way..I would rather have it the original way albeit...agagaaga. If you really want to try this delicacy, share it with 4-5 people. The portion is huge and I could only eat a few spoon. Trust me!! See how thick it is? Surprisingly after having it, I felt my body a bit cooler. Or am I mistaken by the airconditioned room? 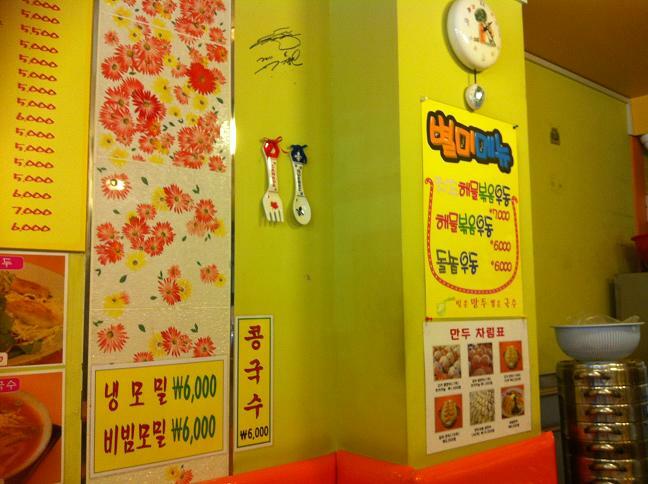 Could you find the price for cold Korean soy bean noodle? This shop is just up the end of the road from Coffee Prince Cafe' (the original one where they did the filming) Hongdae Station, Line 2, Exit 8. This menu is sold only during hot season so if you find it during winter, sorry..it's not sold cause I have tried asking the shop near Namdaemun during winter. I know I'm crazy. 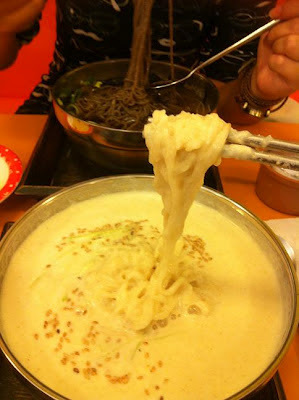 Who wanna eat KKongguksu during winter? Hehehhe..
Not only here but you can find it ubiquitously sold.